Bargello is a type of needlepoint embroidery named after the Bargello Palace in Florence. It consists of upright flat stitches laid in a mathematical pattern to form images. In most of the traditionally pieces that we know of, all stitches go over at least two threads. In the olden days, Bargello was always stitched on canvas using wool yarns, but today many needlepointers are more flexible when it comes to yarn choices for their Bargello work. Traditional Bargello is very durable and suitable for items that will experience wear and tear, such as upholstery, pillows and carpets. As far as we known, it was traditionally not used for clothing. Traditional Bargello designs are very colourful and typically includes many hues of one colour, which is utilized to produce complex shading effects. The typical pattersn are geometric, sometimes in the form of stylised flowers and fruits. Following a Bargello pattern can be quite time consuming for the novice needlepointer, since it is very important to get each square right to end up with the precise mathematical pattern. This type of needlepoint is named after a series of chairs found in the Bargello Palace in Florence. These chairs, dated to the 17th century, have their backs and seats done in needlepoint displaying a flame stitch pattern. 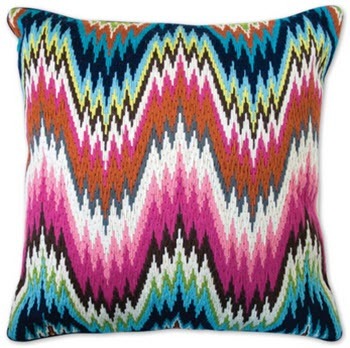 Bargello needlepoint is also known as Florentine needlepoint or Hungarian point. Interestingly, it is chiefly the Italians who have called this type of needlepoint Hungarian point (Punto unghero), indicating that they did not see it as a needlepoint associated with Florence (which is located in northern Italy). Another old surviving example of Bargello is from the 18th century and consists of work done by Queen Maria Teresa of Hungary, who lived 1717-1780. This work now resides in the Hungarian National Museum. As with many other types of needlework, the origins of the Bargello remains unknown, although there are some old stories according to which this type of needlepoint was brought to Florence by a Hungarian princess who married into the de Medici family. The Hungarian-born 14th century Queen Jadwiga of Poland has also been associated with Bargello. The basic unit is normally a vertical stitch of four threads, but other heights are possible. In many Bargello peices, all stitches are of the same height, but this is not mandatory. Even among the really old Bargello peices, we can see examples of stitches of varying height being included in the same work. Diagonal stitches are not used in Bargello. The characteristic Bargello patterns are formed when the vertical stitches are offset vertically, a process known as stepping. A common method is to offset by two threads at the time, provided that one is using four threads as the basic unit. The stepping is combined with changes in color or hue. Rapid stepping down can be utilized to form sharp points and zig-zags patterns. This is commonly known as flame stitch. More slow and gradual stepping will instead result in designs that looks curved to the human eye. This is utilized to create shapes such as medallions. Flame, where the stitches step sharply. Diamonds, where the stitches step sharply, and colour changes create diamond-shaped figures. Ribbonsri, where the stitches are slowly and gradually stepped using different colours. Medallions, where the stitches are slowly and gradually stepped, and colour changes are utilized to create the appearance of spheres or medallions. As mentioned above, traditional Bargello consist of vertical stitches in one direction only. Four-way Bargello is a modern invention, created in the 1960s and popularized in the 1970s by Dorothy Kaestner. With four-way Bargello, you start by dividing the canvas diagonally into quarters. Then, the same motif is worked in horizontal stitches in two quarters opposite from each other. In the remaining two quarters, you do vertical stitching. 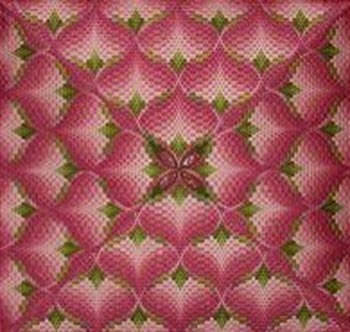 Kaestner created her first four-way Bargello designs by placing a mirror on a traditional Bargello design. The eight-way Bargello was developed from the four-way version. Eight-way Bargello have horizontal, vertical and diagonal stitching.